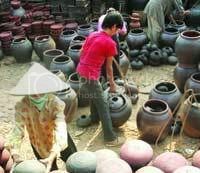 27 May 2007 (Viet Nam News) – This might be of interest to enthnoarchaeologists studying Vietnamese ceramics: a feature on the village of Phu Lang, one of the last few pottery villages which have been producing ceramics since the 15th century. There isnâ€™t much room for pottery in the fast-paced modern world but for the residents of Phu Lang ceramic village, their products are proving not only popular but highly lucrative. Phu Lang is a must-see for tourists in the region, not least because of its natural surroundings. The village sits at the foot of the majestic Son Mountain on the banks of the Cau River, only 18km northeast of Bac Ninh Town along Highway 18. Phu Lang is the last survivor of an old pottery village triangle. Although Bat Trang still produces ceramics, the village has been sucked into the suburbs of Ha Noi as a commune of Gia Lam. The third village, Tho Ha, in Bac Giang Province, has also bent under the pressures of development and industrialisation. But it wasnâ€™t simply through choice that Phu Lang was able to stay true to tradition as location again played a role in providing residents with easy access to the fundamental raw materials of their trade; water, firewood and clay. Of course, Phu Langpottery is defined by the brown colour and specific texture of the raw clay found in the region. But the villagers have a few extra techniques up their sleeves to differentiate their produce from others in the area. Pots are baked in kilns at initial temperatures of 600 degrees centigrade rising gradually to around 1,200oC. Once the clay has cooled, potters add their trademark coat of thick eelskin enamel that gives the brown clay an original yellow tint. Constant production over the centuries has meant that some of the products the village produce are literally museam pieces. Foremost in this case are the vilageâ€™s traditional incense burners used and favoured in the Le (1428-1788) and Mac (1527-1677) dynasties. Examples of these are on display at the Vietnamese Museum of History. It is significant that such a symbol of ancient tradition and culture should survive the aggressive competitiveness of the modern world. And when talking to the locals it seems the secret to success lies not only in artistic talent but also astute business skills. Read the rest about Phu Lang pottery village and Vietnamese ceramic traditions.